Anthony Lark was born in Sydney, Australia. During his career he has worked with, and learnt from, some of the best in the business. Now The Luxury Travel Bible rates him 'one of the best in the business' himself. He started his hotel career as a trainee, working in all departments at the Wentworth Hotel Sydney, he then joined the Regent Sydney (now The Four Seasons) as part of the pre-opening team in Front Office. After 3 years there, he moved to Queensland and also Western Australia, working in resorts. 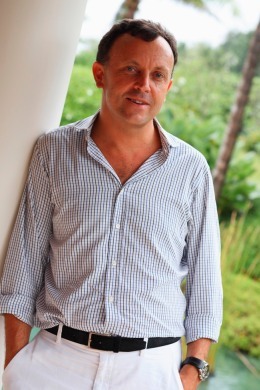 In early 1998, Anthony received a call from Adrian Zecha and agreed to go to Thailand , as Aman resort's first General Manager of Amanpuri in its earliest days. 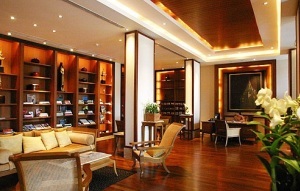 Amanpuri soon became legendary in the quality of the design, service style and location, winning many awards. During his 12 years at the helm of Amanpuri, Anthony was given regional responsibility for the opening of four new Aman resort properties, including Amandari, Amanusa, Amankila and The Strand Hotel in Burma. In 2000, Anthony became one of three partners who own and operate the deluxe 39-villa resort, Trisara. He also had a hand in its design, so when TLTB caught up with Anthony for a drink recently we decided to pick his brilliant-hotel-brain. The resort (and its private villas) has been the recipient of many awards, including 'best of the best', Robb Report, 'Resort of the year', and 'Best Leisure Resort, Worldwide', 2008 by the readers of the Gallivanters Guide , The Luxury Travel Bible thinks it is pretty special too. What inspired you get into the hotel business in the first place? Frankly, I took a job as a buss-boy at the Wentworth in 1978/9, to help me pay my way through design school and I loved picking up glasses and being in a hotel more than school so I stayed!! You've worked with some of the best; Ted Wright at the Regent, Sydney as it was then (now Four Seasons), with Adrian Zecha launching his original Aman resorts and other industry 'names'. What have they all taught you? Ted Wright was such an inspiration. I was a supervisor on the Front Desk when the Regent opened and he was so passionate, with a super-keen eye for detail and was always looking at ways to improve the guest experience. He taught me that being happy and passionate rubs off on the staff. What made you want to create your own resort? My partners at Trisara and I decided to build Trisara the way it is for many reasons. The site naturally lends itself to a small all-pool villa hotel in the center of the bay with both headlands perfect suited for privately owned residences. 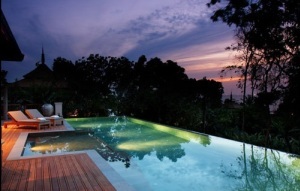 Phuket needed another beautiful small hotel. What is the single best/defining thing about Trisara? The small hotel trend will always survive because service and recognition will define luxury. I guess refinements of the health and spa experiences will continue to be big trends, as right now most destination spa's are more like tropical hospitals. For me it's an unpretentious sense of style that is not really tangible. It comes from the interiors, service, the staff uniforms, the attention to detail, and ultimately the attitude and sense of style of those that run the property. Although its larger and thus busier, I like the Legian in Bali, as with 3 kids, the rooms open out to a massive lawn and its safe for them to run around and I don't feel they are disturbing others. It's got a great breakfast too!! The best day I have had was on July 14th, (Bastille Day) in Paris in 2008. We were staying at what I think is the best city property anywhere, the Four Seasons Hotel George V. They rent a terrace above the Champs Elysees and invite guests to a champagne brunch and view the parade below and the amazing fly-over. Late lunch at the Pershing restaurant and in the evening friends who live in Paris rented a yacht on the Seine. We cruised up past all the monuments to the Trocadero and Eiffel Tower, enjoying a great meal, amazing wines, and a big happy French family...at Midnight the fireworks off the Eiffel Tower are astonishing. First Class seats and the freedom to enjoy the finer things in every destination, without the crowds. Finding the true culture of places you visit.